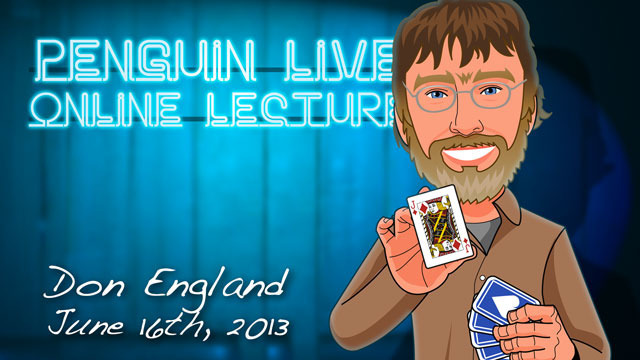 Today, when you order "Don England LIVE", you'll instantly be emailed a Penguin Magic gift certificate. You can spend it on anything you like at Penguin, just like cash. Just complete your order as normal, and within seconds you'll get an email with your gift certificate. Don England LIVE (Penguin LIVE) One of the world's leading experts on gimmicked card magic came to Penguin for an incredible 2-hour live event. SUPPORT LIVE MAGIC. RESERVE NOW AND SAVE. Even as a child, Don England had a strong interest in art, creation, and magic. 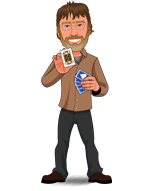 This interest only grew with age and Don has since become one of the leading experts on gimmicked card magic. Don studied under the legendary Ed Marlo where the foundations of his magic skills were first built. 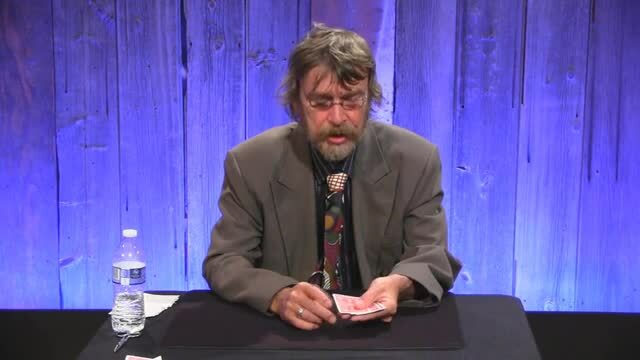 SInce then, Don has had the chance to meet and work with many of the great magicians of our time, teaching and learning, while conjuring up his own, unique magic creations. 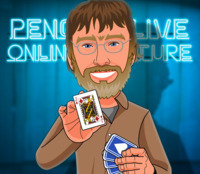 In this Penguin LIVE lecture, Don will go over many effect from his personal repetoir sharing performance and set up ideas including some incredible IMPROMPTU card effects like Liquid Ambition, Doc Daley, Off Center Transpo, The Visitor and Color Change. Don will also go over a few GAFFED card effects including his Shrinking Deck, Paul Harris Peeler, Oil and Water, Color Changing Deck and many more. You'll also learn How to Split a Card, some Poker Tricks, Dice Stacking and share some of his most coveted tips on the PASS, a move he has worked on for many years. If you've never been to a magic lecture, theres never been a better time. Sunday June 16th at 7:00pm, were live-streaming Don England in a spectacular 2-hour interactive online lecture. Watch, ask questions and learn things you won't find in any book or DVD. Purchase the Don England LIVE product. This is your ticket. On Sunday June 16th, anytime before 7:00pm Eastern, click the MyPenguinMagic area at the top of the Penguin site. Youll see the livestream appear 1 hour before showtime. At 7pm sharp, Don will hit the stage and begin his JAM-PACKED professional lecture. Sit back and watch over 2 hours of DVD-quality live streaming magic from the comfort of your own home. Ask Don questions and discuss the tricks DURING the lecture. DONT WORRY IF YOU MIGHT MISS IT. Reserve your seat anyway. Within 24 hours of ending, youll be able to download and/or watch the full lecture on-demand, and go over all the great routines and subtleties as many times as you want. Itll be waiting for you in your MyPenguinMagic area. Magicians flock to see workers give talks. Why? Because these guys see and learn things that you wont find in any book or DVD. Yes, you'll be learning some incredibly powerful A-material, but the INVALUABLE stuff will be the insight you learn along the way. This lecture is for everyone, from the beginner to the professional and for magicians and mentalists alike. Dont miss it! Don is one of my favorite card guys to watch. He constantly fools me with his very smart, cutting edge magic. You folks are in for a real treat! Don was a perfectionist and my magic teacher for nearly 8 years. We'd get together and he'd rip me apart for being anything less than perfect in whatever move he'd taught me the week before. 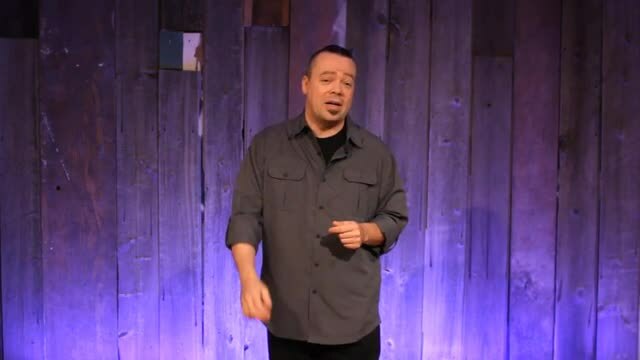 Some of the best comedy you'll ever see in one of these Live Lectures. I had to press pause on more than one occasion because I was laughing so hard. Don was quite the introvert for most of his life. Dan was really struggling to get info out of Don, but this was because it would take several months of Don working with anyone to finally open up a little. Don't let that stop you from buying this. It's excellent. This was a pretty good lecture. I purchased it solely on Patrick Redford's recommendation, and I am glad I did. Don does more than just teach tricks. He teaches how to gaff cards so you can make your own, and he infuses a lot of theory throughout. So, you get incredible magic, good theory and practical skills. This is some of the most interesting, awesome gaffs and gaffed tricks I have seen in quite sometime. If you want to see some interesting gaffed tricks. Check this out. I think this lecture was just ok, at least for me there just wasn't a lot of useful information, and I thought he would cover a lot more on the subject of making your own gaffed cards. I was a bit disappointed with this lecture. As a Magician he is excellent. However in the lecture it was like pulling teeth to get him to explain. I feel sorry for Dan on that one and I have watched so many lectures. I just can't understand, he's not performing any more why wouldn't he want the craft to live on. Very Disappointing for a magician of this level.It seemed as he didn't want to be there. Everyone who sees it can relate. He started to explain the transparent card and then went off on other things and I figured it out but it took time, we'll I bought the lecture to save, inventing stuff myself which I do regularly without charge. 0 of 2 magicians found this helpful.